Catch Jason Scott Lee in “The Rain Follows The Forest” as he sets out on a journey to learn about sustainable life in our island home. Through interesting conversations, he learns about Hawaiʻi’s fragile fresh water supply and discovers connections to our upland forest environment. The Rain Follows the Forest from Hawaii DLNR on Vimeo. Mileka Lincoln, with Hawaiʻi News Now, takes a visit to Mt. 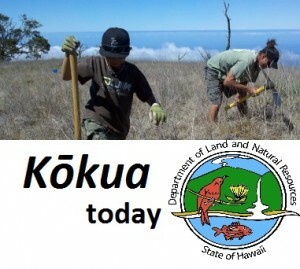 Kaʻala Natural Area Reserve with DOFAW Staff during their efforts to restore the Native Hawaiian rainforest and preserve the watershed. Why do watersheds matter? Watch these short videos to learn the importance of watersheds in Hawaiʻi.